Multiple voltage control : In this technique the shunt field of the motor is permanently connected to a fixed voltage supply, while the armature is supplied with various voltages by means of suitable switch gear arrangements. The Fig. 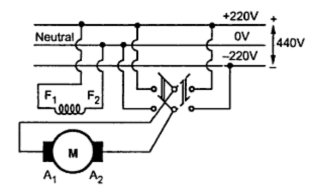 1 shows a control of motor by tow different working voltages which can be applied to it with the help of switch gear. In large factories, various values of armature voltages and corresponding arrangement can be used to obtain the speed control. 1. Gives wide range of speed control. 2. Speed control in both directions can be achieved very easily. 3. Uniform acceleration can be obtained. 1. Arrangement is expensive as provision of various auxiliary equipments is necessary. 2. Overall efficiency is low. 1. Identify the method of speed control i.e. in which of the motor, the external resistance is to be inserted. 2. Use the torque equation, T Φ Φ Ia to determine the new armature current according to the condition of the torque given. Load condition indicates the condition of the torque. 3. Use the speed equation N Φ Eb/Φ to find the unknown back e.m.f. or field current.